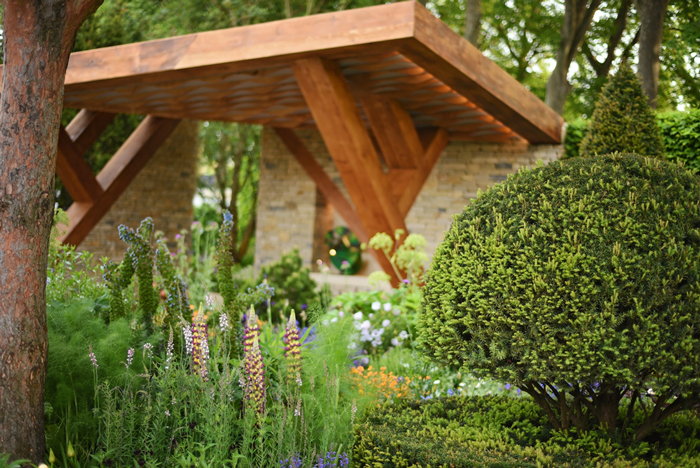 Sandy Felton takes a look at the Main Avenue show gardens creating the buzz at this year’s RHS Chelsea. There may be fewer show gardens at the 2017 RHS Chelsea Flower Show than in recent years, but this in no way inhibits the quality, innovation and outstanding design credentials of the world’s premier flower show. 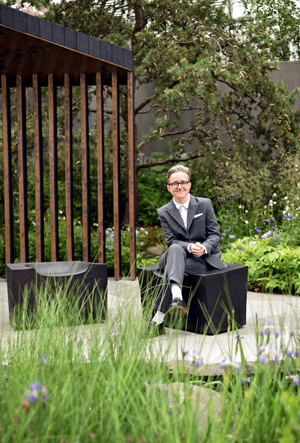 The Best in Show and Gold Medal winning M&G Garden, designed by James Basson, is a case in point. 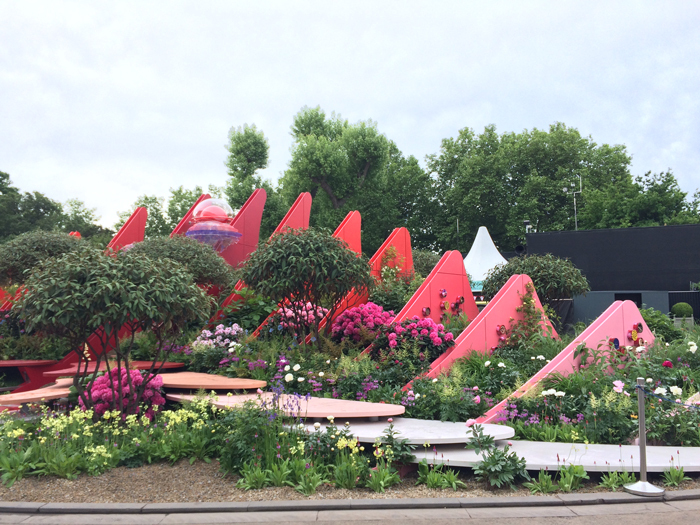 (banner above) This innovative and bold garden brings to Chelsea a taste of Malta and its ecological challenges. An abandoned quarry is not a topic a garden designer might at once conceive for Chelsea, however, here James has played an ace card. Malta has made significant inroads into dealing with its ecological challenges, such as scarcity of water, the need to recycle and composting. These are challenges that we too may face in the UK and need to consider to protect our environment. So this bold design, structuring a garden within a quarry, with its own ecology from coastal to woodland is not only a signpost to current environmental problems but also a lesson in using plants to adapt to a changing climate and as he says it is not meant to be pretty but it is meant to make us think. It does just that. James explains that it took two years to plan the garden. He went out to Malta to collect the seed for many of the plants, native only to the island. Some have never been seen in the UK before and the Maltese government has given James special permission to use them. The giant monolithic pillars of Maltese limestone are awesome and tower over the Chelsea site. From grasses, heathers and evergreens, the design has all the hallmarks of a traditional Mediterranean garden, but with an innovative edge. Because of the rarity of some of the plants they will be looked after following the show by Crocus who will nurture the strongest. It’s always good to see young designers at Chelsea and the Royal Bank of Canada’s choice of designer for their Main Avenue Show garden, Charlotte Harris (pictured left) has proved highly successful with a Gold Medal. Charlotte and her all female team have created a beautiful interpretation of Canada’s Boreal wilderness. The Jack pines (Pinus banksiana) star in this lovely garden containing over 60% of the planting sourced from Canadian natives. Charlotte has found her first Chelsea as a lead designer pretty amazing: “There have been moments when its been very sleepless but actually seeing it come together and working with an amazing team then being here today just chatting to people about it, has made all the hard work worth it.” I really loved this garden. 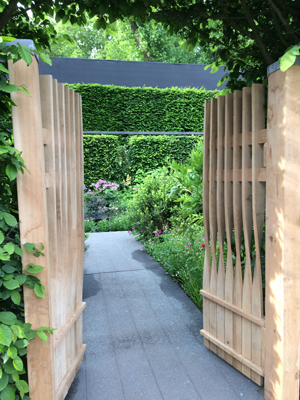 ‘The Linklaters Garden for Maggie’s‘ is a hidden garden viewed from an elevated pathway above, while keeping it secluded from the front by a three-metre high perimeter hedge. 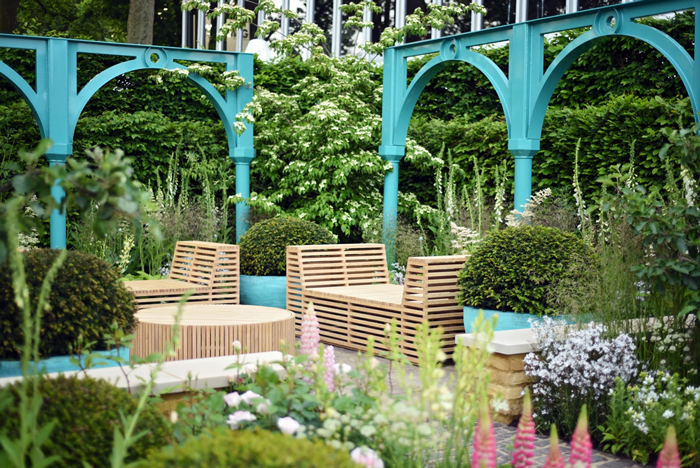 Designed by Darren Hawkes the garden is another Gold Medal winner and after the show elements of the design will be used to create a garden for the new Maggie’s Centre currently under construction at London’s Barts Hospital. You can peek into the secret garden through gaps in the hedge as well as an inviting aspect through a beautiful pair of wooden garden gates. The interior is calm and relaxing with particularly stunning benches made from basalt concrete. ‘Breaking Ground‘, (pictured below) designed by Andrew Wilson and Gavin McWilliam (Gold) highlights Wellington college’s ambition to break down barriers. The planting on this garden is gentle featuring ornamental meadow plants that explode with sparkling umbels. These are in stark contrast to the series of transparent steel walls and the heathland landscape at the back of the garden. Lots of messages on this garden and stark contrasts beautifully brought together. ‘The Morgan Stanley Garden‘, (pictured below) designed by Chris Beardshaw (Silver-Gilt) is, as one would expect from this master plantsman, a soothing and delightful garden inspired by the fractal geometry and patterns found in nature, music and art. I have always liked Chris’ ability to use the colour blue so effectively and as he says, the colour creates that feeling of space and calm and once again its used to good effect here. After the show this garden is being donated to Groundwork who will redesign and re-purpose it. I was struck by the contrasts on the ‘Silk Road Garden, Chengdu, China‘ (Silver-Gilt – pictured above)designed by Laurie Chetwood and Patrick Collins. Situated on the triangle site, this is always a difficult area for designers but Chetwood and Collins came up with a triumph and I loved it. Another bold design it perfectly encapsulates China and the silk roads and incorporated some fabulous planting. 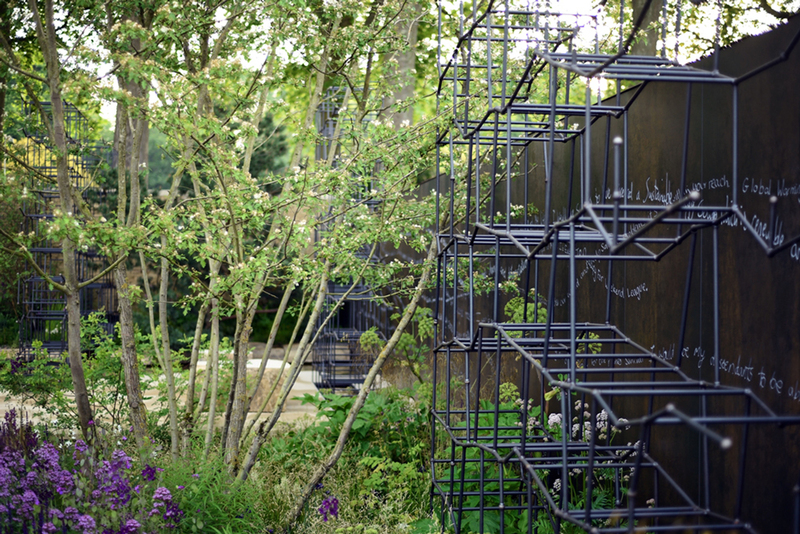 Lee Bestall’s garden (pictured above) – ‘500 Years of Covent Garden‘ (Silver) brings to life this historic area of London from its origins as an orchard garden to the bustle of the present. 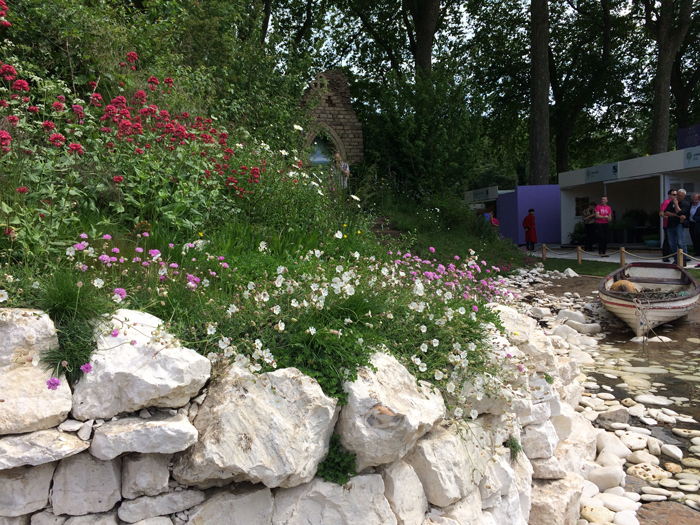 Silver was also awarded to ‘The Welcome to Yorkshire Garden‘ (pictured below) designed by Tracy Foster with its chalk cliffs, beach and sea complementing the wild planting of grasses and native trees. 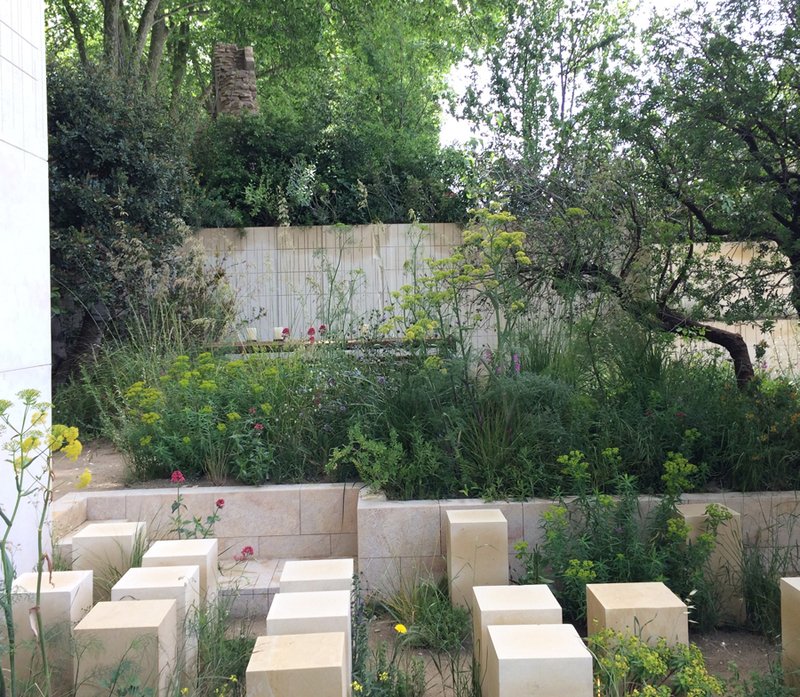 Finally there is the unjudged Greening Grey Britain garden, designed this year by Nigel Dunnett. Lots to learn from this garden set among high rise and apartment developments with the focus on inspirational ideas where space is at a premium. I could have spent most of the morning just looking at this garden alone – so much inspiration and easy achievable ideas. 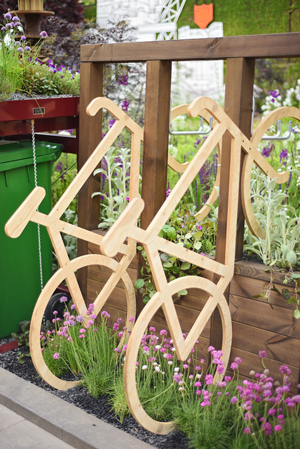 Just loved the bike rack and ideas for bug hotels and wildlife.There is plenty of low-input, high impact planting here and ideas for pollution-soaking plants as well as water-sensitive ideas, such as rain gardens and wetland areas to deal with flooding. There is certainly variety on this year’s Main Avenue and because there are less show gardens I think the public will appreciate the fact that they will be able to spend more time on each one. 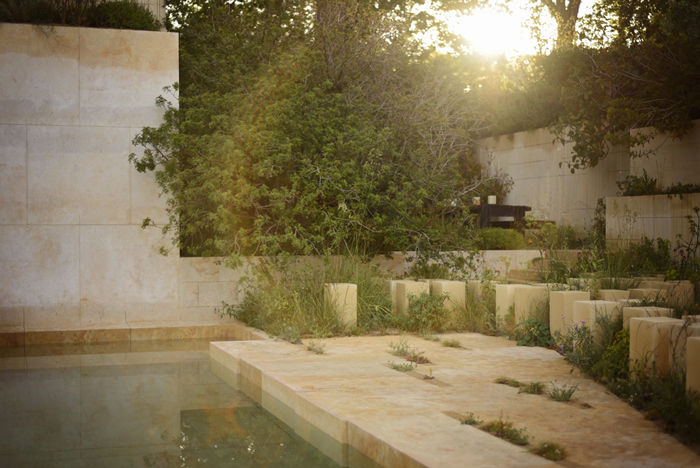 I did, and although I am unlikely to want to build a Maltese quarry in my back garden, I take away the knowledge of the planting concept and ecological message that it heralds as well as a thousand and one other ideas to inspire on Main Avenue. All photography is ©2017: Reckless Gardener credit Emma J Campbell Photography.